"A BIT of French medievalism trans­planted to the North American woods." "A survival of the institutions of the twelfth century." The foregoing are some of the remarks made by visitors to the monastery of the Trappist monks established near Oka, in the province of Quebec, upon a piece of rocky, swampy and apparently worthless land, which no farmer would touch, though it is nearly 200 years since colonization began in the neighborhood. The success of the Trap­pist monks who were expelled from France in 1880 in transforming what appeared to be worthless hills and swamps into smil­ing fields and fruitful gardens is an evidence of what voluntary labor can ac­complish in a short time when the cost of living is reduced to a minimum. The village of Oka has a history of its own, dating from before the French revo­lution. Here the Sulpicians obtained a grant of land from the King of France and established a mission designed to convert the Iroquois to Christianity. Oka is situated on the Ottawa River, which at this point widens into the Lake of Two Mountains - so called from the mountains which rise on either side and throw their shadows upon its waters. The village is ninety miles below Ottawa, the capital of the Dominion, and thirty miles above Montreal. The steamers of the Ottawa River Navigation company touch at Oka, where a splendid wharf has been built by the seminary authorities. The place can also be reached by carriage road from Montreal or by rail to Como. Ten miles below Oka is St. Anne's, where the waters of the Ottawa meet those of the St. Law­rence. At St. Anne's Tom Moore spent some time. It was there he wrote his "Canadian Boat Song," and the house in which Moore lived is still pointed out to tourists. Some miles above Oka is the famous Carillon dam, one of the engineer­ing wonders of this continent. This dam extends all the way across the Ottawa River, creating an artificial cataract nearly a mile wide and twelve or fifteen feet high. This work was constructed by the gov­ernment of Canada at great expense for the purpose of flooding out a rapid on the river and increasing the depth of water in the Carillon canal. Carillon is also an historic spot. It was here that a small band of sixteen young Frenchmen met and resisted a host of Iroquois, who were descending the Ottawa to destroy the French settlement in 1660. The French­men fought for ten days, or until the last of their number fell, and inflicted such loss upon the savages that the latter were obliged to abandon their designs. The valor of the "Hero Martyrs of Carillon" is told in French-Canadian song and story. In 1717 the lands upon which the village of Oka is built, together with a large area of the surrounding country, were donated by the King of France to the ecclesiastics of the order of St. Sulpice in trust to provide for the education of the Indians. The grant to the Sulpicians was confirmed by the British crown after the conquest of Canada by England in 1763. The Indians on the Oka seigniory have frequently sought to maintain a claim to proprietor­ship in the lots occupied by them, but their claims have been rejected by the govern­ment of Canada. Out of this struggle between the Indians and the Sulpicians over the proprietorship of the soil have grown those difficulties which have made Oka and its Indians known to the whole North American continent. The law officers of the Canadian gov­ernment have on various occasions declared that the Indians have no property in the lots which they occupy; that the title of the Sulpicians is indisputable. A bitter sectarian feeling has been aroused at times over the matter, in consequence of the action of the Iroquois, some years ago, in formally renouncing the religious faith taught them by the Sulpicians and embracing Methodism. This had the effect of enlisting on their behalf the sym­pathies of a large portion of the popula­tion of the Dominion, and in almost every Methodist conference held during recent years The Oka Question has been dis­cussed and the cause of the Indians warm­ly championed. The Sulpicians claim that they received the lands from the crown on condition that they should civilize the Indians, as­sist them and instruct them in the Roman Catholic faith; that they are still anx­ious to fulfill that trust, and that those Ind­ians who refuse to accept their teachings have no claim to assistance or considera­tion at the hands of the seminary. The Dominion government has endeavored to solve the difficulty by moving those Indians who are Methodists to a settle­ment in western Ontario, but the scheme has been only partially successful. About seventeen years ago a Methodist church built at Oka for the use of the Indians who had embraced that faith was burned down and shortly afterwards the Cath­olic Church and presbytery were de­stroyed. A number of Methodist Ind­ians were arrested and tried for setting fire to the property of the seminary. At the first trial the jury failed to agree, but at the second the Indians were acquitted. The church, presbytery and convent now seen from the landing were built in 1877 upon the sites of those burned down short­ly before. The present village of Oka is populated by Indians, French Canadians and Metis, or half-breeds. It is a straggling village of wooden buildings. The Methodist Ind­ians reside chiefly in the outskirts of the village. The principal buildings are the church, presbytery and convent which contain some fine old paintings, brought to Canada during the troublous times of the French revolution. Upon the high altar in the church is a large solid silver statue, presented to the Oka mission by King Louis XV of France. 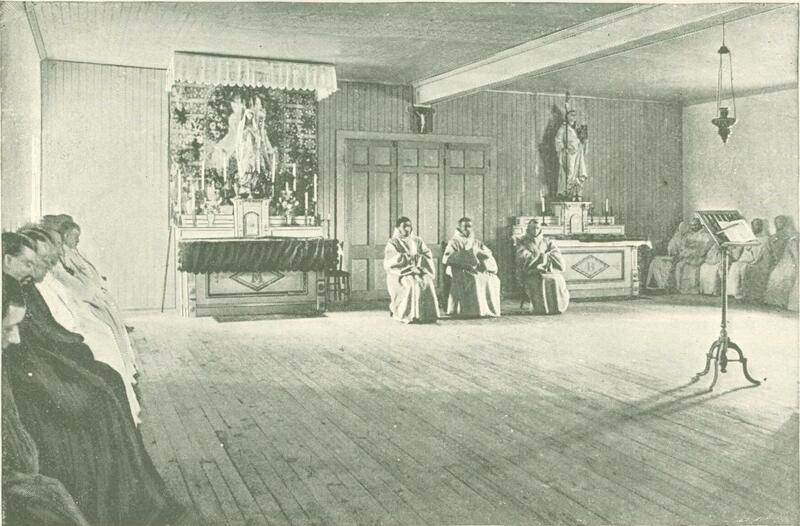 The first convent was built at Oka in 1720. Many of the works of art in the church and presbytery were painted early in the eighteenth century. The cure pointed out to us a large painting representing the massacres of the three Jesuit martyrs, Brebceuf, Lallament and Jorgues, by Iro­quois Indians on the shores of Georgian bay in 1649, and proudly informed us that the Christianized Iroquois now living in and around Oka were the descendants of the very savages who so cruelly mas­sacred the three Jesuits named. A large monument to the memory of the three martyrs was lately erected near Quebec. 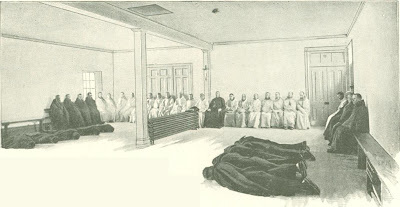 The bodies of a number of the early French missionaries lie buried beneath the church at Oka. Four miles northeast of Oka, on the road towards St. Eustache and Montreal, is the monastery of the Trappist monks. The road from Oka is rough and uphill. To the left as we leave the village rises the Mount of Calvary, a high, sharp peak, upon the sides of which seven small chap­els or shrines have existed for many years, and up this mountain the faithful make pilgrimages. The three highest of these whitewashed chapels are visible from the lake. On the side of another hill, to the right of the roadway and facing the river, stands the large three-story wooden build­ing which was the first home of the Trappists, after they had got fairly under way. The building is now used as a storehouse and barn. It was found too cold and shaky for a dwelling, owing to its being exposed to the high winds from the lake. Moreover, the monks found it necessary to have their chapel, cloister, sleeping quarters, etc., close to their prin­cipal working fields, which are behind the mountain. As we approach the old monastery the fields differ in appearance from those of the French farmers whose homesteads we have passed. The boulders, which in some places covered the ground to such an extent as to make it difficult for a sheep to find pasturage, have been gathered into well-shaped stone walls or fences. Some fields have been denuded of stones altogether and young orchards planted therein. Others seem to have been set apart as "boulder cemeteries," being given up altogether to the huge, whitish rocks carried from other sections of the farm. There is an appearance of systematic industry as soon as we come upon the estate of the silent monks. Descending the hill behind the old mon­astery, the new monastery, a solid-look­ing four-story L-shaped building with a tiled roof, comes into view, surrounded by barns, mills, forges and other industrial hives. The monks have utilized the current of a small stream, and by care­fully husbanding the water and lifting it out of its course by means of a wooden sluice have obtained sufficient power to operate a sawmill and a gristmill - the water which turns the "overshot" wheel of the sawmill serving afterwards to turn the flourmill wheel below. Visitors to the monastery are always well received and cared for, hospitality being one of the rules of the order. But the greatest personage in the land receives exactly the same treatment as the humblest wayfarer who may seek a night's shelter. A portion of the build­ing is fitted up as quarters for guests, and one of the officials of the monastery is the "guest master," who looks after the com­fort of visitors. Arriving at the entrance to the monastic grounds the visitor finds, in staring letters, on a white board, the warning: "No Ladies are Admitted Here." The notice is in French and English. "These men evidently know how to preserve peace in their home," growled a bachelor member of our party, as, leaving our horse to be cared for by a lay friar in a long, gray, hooded cloak, who uttered not a word, we made for one of the entrances to the building. The door was opened by a tall monk with a bushy beard and long eyelashes, clad in the white robe worn by clerical members of the order. He did not speak, and when we addressed him in English he lifted his shoulders and dropped his arms in the way peculiar to Frenchmen, and which is so aggravatingly expressive. But in response to an inquiry for the superior, made to him in French, he beckoned us to follow him as he shambled through the room and into a long hallway which we afterwards found was the cloister. Along this corridor we were taken until a room was reached in which the abbot or superior of the monastery was found, transacting business with one of the French-Canadian farmers of the neigh­borhood. The monastery was formerly a priory. Now it is an abbey; and Father Antoine, who was formerly the prior, was duly elected abbot. The abbot received us very courteously and invited us to spend the night in his monastery. 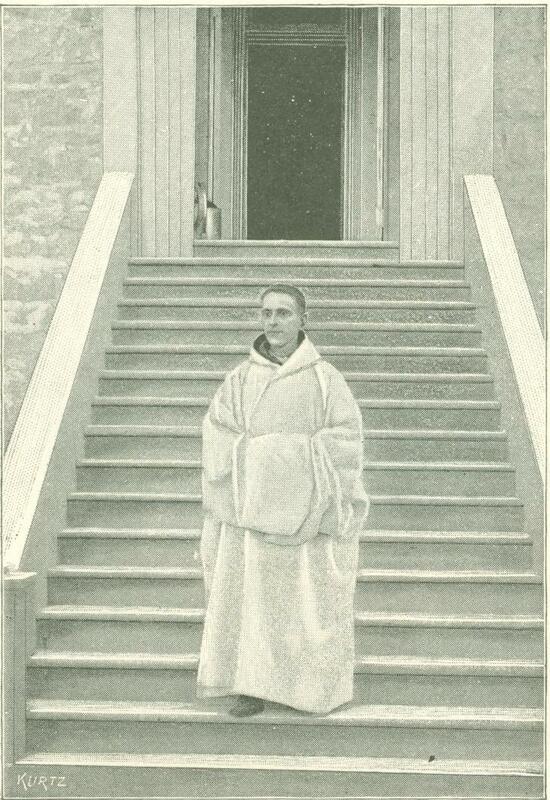 Soon the guest master, Father Peter, a young French-Canadian priest, who joined the order a few years ago, appeared and conducted us to our quarters on the ground floor at the west end of the main building. 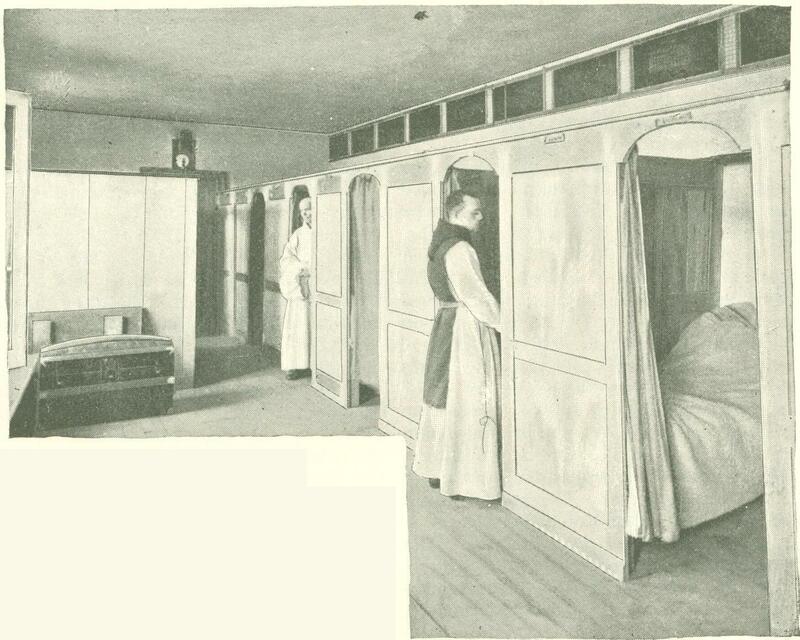 The rooms were neatly furnished. The floors of our bedrooms were bare, but scrupulously clean, and on the walls hung some religious pictures. Father Peter promised to return shortly and take us to supper. The monks were assembling for evening service, the lay members of the order clad in brown cloaks and heavy boots, the clerics wear­ing white woolen cloaks made of fine cloth imported from France. The in­stitution is thoroughly democratic. The abbot is obliged to conform to the rules as rigidly as the humblest laborer in the monastery. 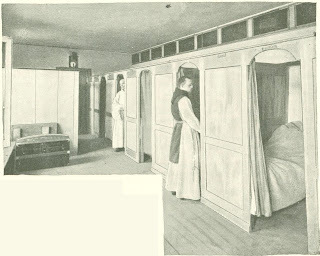 He sleeps, like each of the others, upon a straw mattress placed upon a shelf in a cell about half the size of an ordinary stateroom on a steamship. It is to be said, however, that the build­ing is thoroughly equipped with the most improved heating and ventilating apparatus. Soon Father Peter returned to inform rules are not strictly observed, the guest master continued, "but they are. We never speak to one another, except to give the salutation, Remember Death. We eat only bread, vegetables and water. Sometimes we have a little rice and cider. We never taste meat, fish, butter, eggs, cheese, tea or coffee. We never use milk except when mixed with cooked rice. Yes, it is a severe life. We never receive any newspapers, and can only write oc­casionally to relatives." And then he began to tell us of occurrences in his life " when he was in the world," which made us feel as if we had passed the us that supper was ready, and we fol­lowed him down into the basement, where a meal of mashed potatoes, coarse, dark-colored bread made on the premises, but­ter, tea, coffee and eggs had been pre­pared. "We never give our visitors meat," said Father Peter, "and, of course, we never take any ourselves. You have before you all that we ever offer to visitors, even the archbishop, when he comes." He produced, however, two black bot­tles of cider, which he said the monks manufactured, and which is their only drink, besides water. "A great many may think that our River Styx or had been transplanted to another planet. 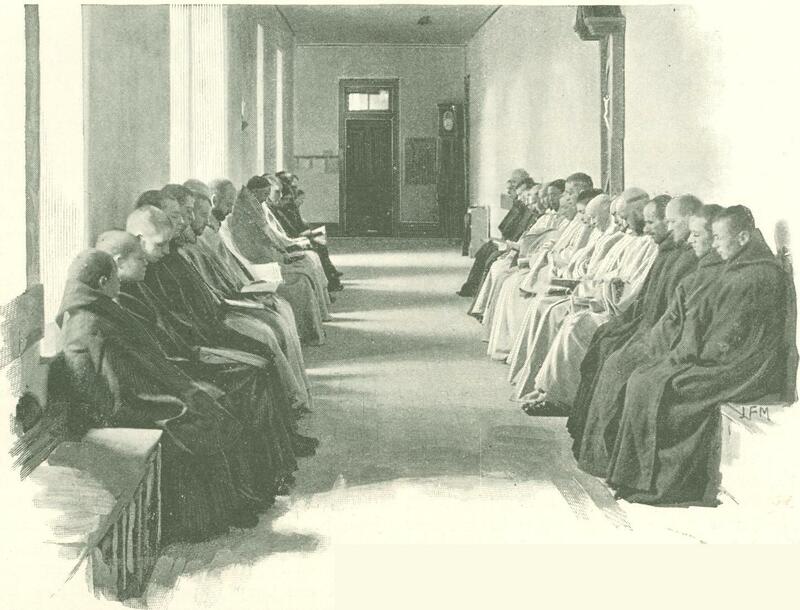 The establishment of the monastery, Father Peter told us, dated from 1881, the year in which "the bad government of France" expelled the Trappists from that country. 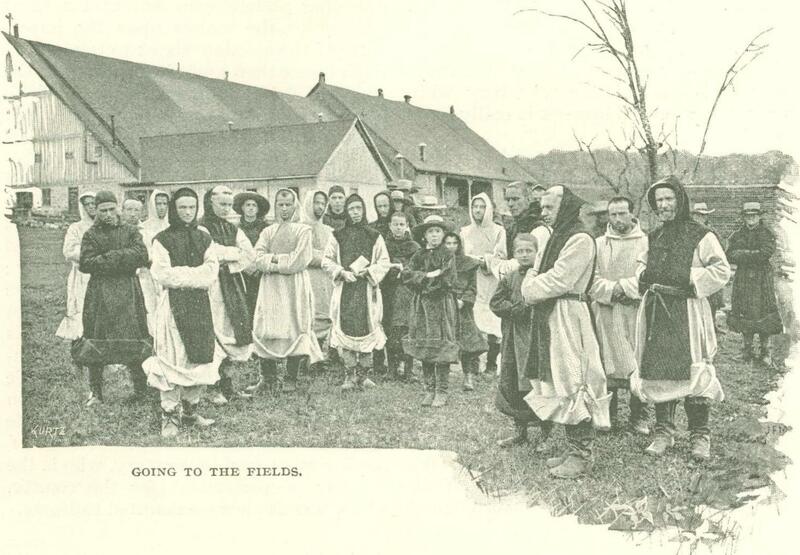 Four monks came to Canada, and the Seminary of St. Sulpice, a wealthy ecclesiastical corpora­tion with headquarters in Montreal, gave the order the 1000 acres of waste land which the monks are rapidly transform­ing into a magnificent farm. "See that little shanty out there," said Father Peter, pointing to the first home of the Trappists here;" see what we have ac­complished in ten years." To what do you owe your success chiefly? "God is good to us. We work only for His glory. We strive to reclaim the waste places of the earth and make them fruit­ful. The men work hard, and you see it costs us very little to live. Our clothing does not cost much, and our food practi­cally nothing. Our lives are devoted to work, prayer and meditation." "How do you carry on business with the outside world?" "The abbot engages and pays the laborers, whom you see working with our friars in the mills and the creamery, and when we have any produce to sell he either goes to Montreal himself or commissions someone to go for him. We have a splendid lot of stock - horses, cat­tle and pigs - and we make some rev­enue out of pork." He also informed us that the monas­tery and surround­ing estate had been mortgaged for $40,000 some years before to raise money for necessa­ry improvements, but that this debt was gradually be­ing paid off. 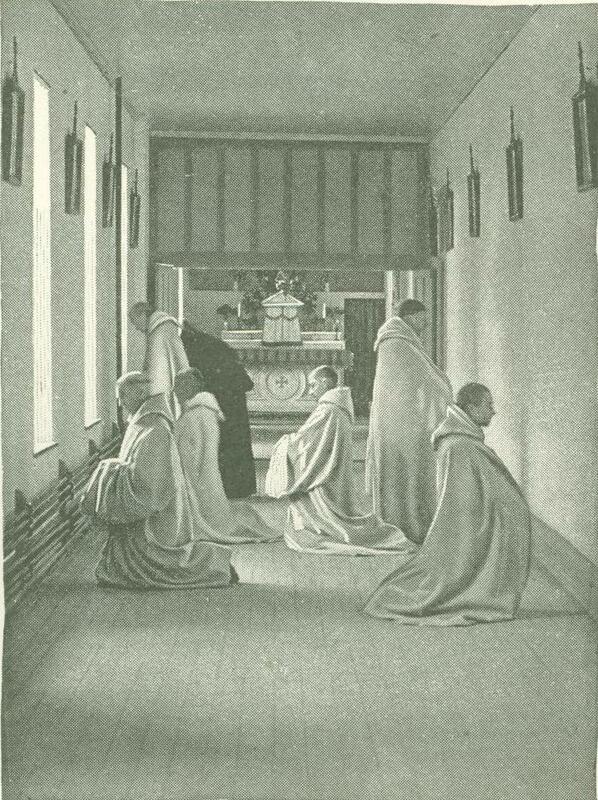 At eight o'clock every evening the Trappists retire to their sleeping quarters, and when that hour approached a young visitor was sent to ask us to go to the chapel and hear the evening hymn of the Trappists, which, we were told, is chanted exactly as it was in the time of St. Benedict. Every Trap­pist is a member of the choir, and all took part in the solemn singing of the evening hymn, which was accompanied by the notes of an organ. 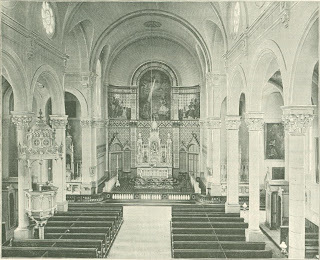 The chapel is on the fourth story of the building, and to reach it we have to pass through the chapter, a square room, with two altars at one side, benches running around the three others and an organ near the center. It is in the chapter that monks who have violated the rules of the order make their self-accusations, prostrating themselves upon their faces on the floor and begging pardon of God and their brethren. 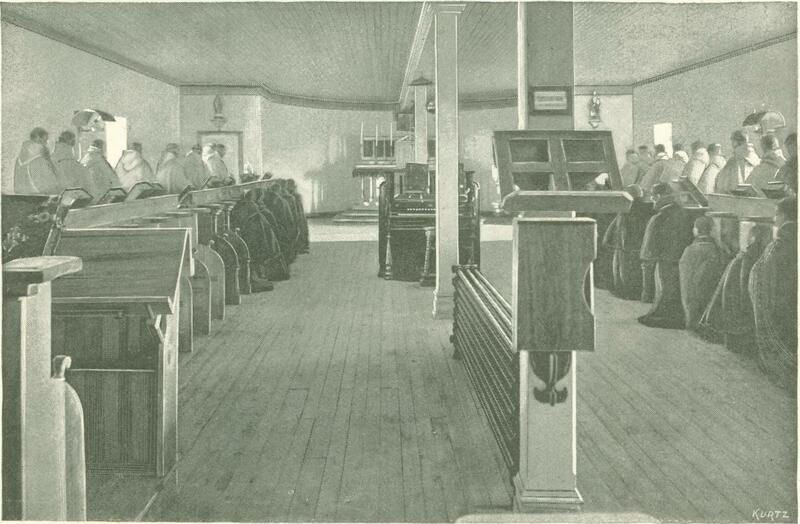 In the chapel are wooden stalls, one for each monk, in which they sit, stand or kneel during service. After the evening hymn had been sung, the monks, in brown and white cloaks, filed into the chapter, where a litany was chanted, and then they dispersed for the night. The guest master piloted his charges back to their quarters, warning them not to make any noise, because there might be some people mak­ing retreats in the adjoining rooms, who might com­plain if disturbed. "From now until two o'clock in the morning," said Father Peter, is what we call dead silence.' Not a word is spoken by anybody - not even by the abbot. If something extra­ordinary happens, if a friar is taken very sick, for in­stance, word is brought to the ab­bot, and he sends for a physician or does what is neces­sary." "And how do you do when it becomes absolutely necessary to communicate with each other in the fields?" "There is a foreman or director of each branch of the work. He is entitled to give instructions which the others follow. If anything more is needed a friar goes to the abbot or the second superior and he at­tends to the matter." At a quarter past eight it was dead silence indeed. Not a sound could be heard within the walls of the monastery. In winter the Trappists retire at seven o'clock, and in summer they sleep for an hour in the middle of the day, from twelve to one o'clock. At two o'clock in the morning the loud clanging of the bell on the roof of the building notified us that the Trappists' hour of rising had arrived, and at five minutes past two all the monks had assembled in the chapel for matins - the first morning service. The time be­tween half-past two and four o'clock is devoted to pious meditations, private devotions, masses and the office called "Prime," the latter lasting about twenty minutes. At six o'clock in summer and at seven in winter the office of "Terre" is attended, and then the monks disperse to their various duties, returning at eleven o'clock for the office called "Sexte." In summer the first meal of the day is taken at half-past eleven o'clock and in winter the dinner hour is half-past two. At half-past four vespers are sung. This is fol­lowed by a light collation, usually bread and water, and the ninety minutes from half-past six until bedtime are consumed in chanting the Salve Regina, the evening hymn, and sometimes a litany. During the season of Lent the first and only meal is taken at half-past four P.M. On Sun­days matins and lauds are sung, instead of being merely recited as on ordinary days, and as this takes an hour longer, the Trappists rise at one o'clock, and on spe­cial feasts known as "doubles" they rise at midnight, and the singing of the canon­ical matins occupies three hours. The lay monks, those who have not been ordained as priests and who wear the brown habit, are not required to attend the singing of the various offices. At three o'clock they begin their duties for the day. At four they return and hear mass. In summer the clerical monks, laying aside their cloaks and appearing in the "under costume," as it is called, spend six hours daily in manual labor, and in winter four and a half, and they are allowed two hours for study in summer and four in winter. The Trappists are dead to the civil law of Quebec. They cannot as individuals own any property or sue or be sued. The monastery is a little principality of itself. It is governed by its own peculiar code, but the abbot is a strictly constitutional ruler. His discretionary powers are rigid­ly limited. When a monk dies he is buried in the cemetery attached to the monastery, and is remembered only in the prayers of those inmates of the abbey who survive him. There are now sixty-three Trappists in the abbey at Oka, twenty-eight of whom have been ordained as priests and wear the white robe. Some of the lay members of the order are boys under twenty years of age. Father Peter informed us that in 1889 a number of boys were brought to the monastery from a Montreal orphan­age, the design being to teach them how to farm. But the work of instructing those boys interfered so seriously with the rou­tine and rules of the Trappists that they were sent back to the orphanage, with the exception of four or five who elected to become members of the order. "Can men leave your order, and do they leave?" the guest master was asked. "A certain time is allowed as the proba­tionary period after a man joins the order. During that period he is at liberty to leave when he pleases. After the novice has made his final vows and renounced the world, he can only leave after obtaining special permission and for some valid reason, such as ill health, family necessi­ties or some equally good grounds." "Do not men break down under such rigid and austere discipline and such poor fare?" "At first the life is exceedingly severe, but we gradually get accustomed to it. There is very seldom any sickness among the friars." 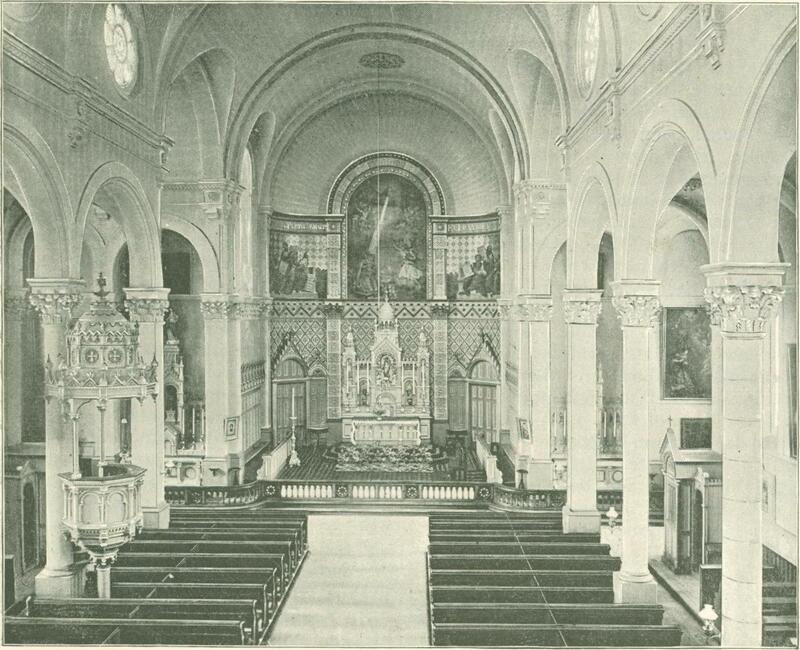 At four o'clock a novice was sent to in­vite us to go to the chapel to attend a mass. It was gray daylight. To special reach the stairway leading to the chapel we had to pass through the cloister. Here we found monks praying before the Sta­tions of the Cross, sitting upon their boxes engaged in study, or writing on the sills of the high windows which look out upon the rear of the abbey and the rude cross which marks the burying ground. Their long white cloaks made them look like so many ghosts. In the cloister no word is ever spoken, even by the abbot. Along the sides of this hallway, on the floor, for part of its length are small boxes, about a foot square. Those boxes serve as seats and each contains all the worldly possessions of the Trappist whose name it bears; there is a rough chair for the abbot. Each box contains a few books and tracts, and the whip with which the owner lashes his body every Friday. The second superior, next to the abbot, is Father Pius, and the secretary is Father Joseph. Both these gentlemen are said to belong to eminent families in France. The early morning services in the chapel are very impressive. 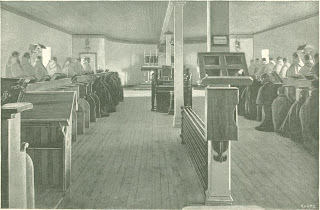 There are four rows of wooden stalls, and for the greater portion of the time from two until five o'clock the monks stand or kneel in these. 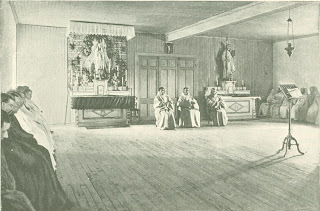 In the dim light of the altar lamps, wrapped up in their white or brown robes, with shaven heads and humble countenances, they chant their psalms in those sonorous tones peculiar to the monastic orders, and when the notes of the organ peal forth the situation is suf­ficient to excite religious emotion and en­thusiasm in the hearts of the most in­different. "As surely as we live there are saints in this house," said an old recluse who was formerly a book dealer in Montreal, but who now makes the monastery his home. "They follow the rules most rigidly. Not a word is ever spoken in that cloister, and the way they whip themselves on Fridays - it is really terrible." Each abbey is an independent estab­lishment, but the monks at Oka recognize their former home, the Abbey of Belfon­taine, France, as their parent house, and so the Mitred Abbot of Belfontaine, the Prior General of the Trappist order, came to Canada to preside over the ceremony of transforming the Oka priory into an abbey. The election of the new abbot was conducted in accordance with the rules provided by St. Benedict himself. Every member of the order, lay or clerical, attached to the monastery has a vote at the election of an abbot, who is chosen for life. On the morning that the Oka house was raised to the dignity of an abbey the usual early mass was celebrated by the Abbot of Belfontaine. Then all the doors of the monastery were closed and locked and the keys handed to the presiding prelate, who delivered a short address to the monks upon the impor­tance of the election about to take place. Each monk then knelt in turn before the Abbot of Belfontaine, and swore to fulfill his duty according to his conscience, then deposited his ballot in the box and left the room. After all had voted three scru­tineers counted the ballots and declared Father Antoine duly elected to the office of abbot of the monastery. The bells were then rung, the doors were unlocked and the monks reentered the chapter; after which the new abbot knelt before the officiating prelate, who instructed him in his duties and placed a mitre upon his head. The monks then swore to be faith­ful unto death to their abbot, and the Te Deum was chanted in the same tone as in the abbeys of Europe during the middle ages. A minute of the proceedings of the day was taken by a notary, who is the Member of Parliament for the county, which was at once transmitted to Rome. 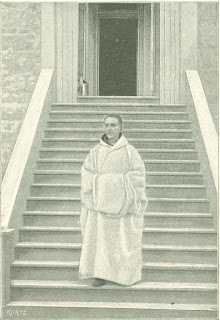 It is almost incredible that men of which had been decapitated because the culture, intelligence and wealth should forsake the world to lead the life ­hardship, privation, isolation and silence peculiar to the Trappists, but many do so, and all their property passes to the monastery which they enter. The first monastery of this order was near Mortagne, France, and was founded re ­in 1140 by Rotrou, Count of Perche, who gave it to a colony of Benedictine monks. A narrow gorge called La Trappe, which gave entrance to the building, gave it also ­its name. In 1664 the order was revived and reorganized by De Rance, a godson of Cardinal Richelieu. There are strange and romantic stories told as to the causes which led De Rance to forsake his life of pleasure and luxury and to devote him­self to reforming by precept and exam­ple the rules of the Trappist monastery. He had taken holy orders, but his life was ­for years a scandal. The sudden death - of the Duchess of Rohan-Montbazon is said to have given him the shock which turned his whole course of life. It is re­lated by some of De Rance's contemporaries, but disputed by his biographers, that he arrived at the duchess's house unaware of her death, and entered her apartments without warning, only to find the woman's head lying apart from her body, which had been decapitated because the coffin was too short and there was no time of to procure another. This story is discredited, but certain it is that De Rance's reformation dates from about the time of duchess's death. He sold large portions of his property and distributed the proceeds between hospitals and the poor, but retained sufficient to enable him to pair La Trappe, of which he had become the proprietor. He found the abbey in a deplorable condition, and the monks who occupied it were so far indisposed to listen to his reform schemes that they threat­ened to kill him. But he pensioned the incorrigibles off and filled their places with men of the strict Cistercian order, and in a short time De Rance himself became the abbot. His plans were approved by the Pope, and he established the rules which prescribe silence, labori­ous manual labor, hard beds, coarse clothing and general abstinence from flesh meat, eggs, fish and wine. De Rance further ordained that each monk should spend some time each evening his digging his own grave, and should sleep on straw in his coffin. Besides the Oka abbey there are only three other small Trappist establishments in America - one in Nova Scotia and two in the United States. If you enjoy reading Digital History Project - Consider making a donation today. Every dollar donated will help us publish more articles and illustrations. With your help we can turn this site into a real look at History - Past, Present, and Future. All donations over $100 will be acknowledged on our Donor Thank-you page, unless we are specifically notified not to list you.